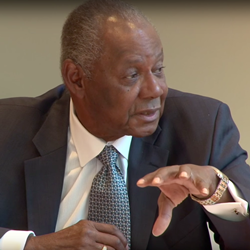 CBTU President Emeritus Bill Lucy spoke at the AFL-CIO Ideas at Work luncheon and recalled the events surrounding the 1968 Memphis sanitation workers strike. In early February 1968, Memphis sanitation workers reached a tipping point in their dealings with the city following the deaths of two garbage collectors by a malfunctioning truck. As a speaker at the AFL-CIO Ideas at Work luncheon, Coalition of Black Trade Unionists (CBTU) President Emeritus Bill Lucy spoke about the strike that followed and how it evolved into a civil rights landmark. The city, which had a long pattern of neglect and abuse of its black employees, refused to recognize their union and its demands. Eleven days after the workers’ deaths, 1,300 frustrated members of AFSCME Local 1733 struck for recognition, better safety standards and decent wages. The end of the strike seemed to be in sight by February 22, but the situation escalated when police cracked down on a group of non-violent demonstrators. Memphis’ black community became galvanized in support of the workers and what ensued was a drawn out civil rights campaign with national implications. On March 28, an estimated 22,000 students, black and white, skipped school to participate in the demonstration. “I Am a Man” emerged as the call for recognition of poor black workers. Civil rights leaders, including Rev. Martin Luther King Jr., came to the city in support. King gave his now famous “I’ve seen the Promised Land…” speech to a crowd of sanitation workers on April 3. He was assassinated the following day. Despite the assassination, Lucy asked the workers to continue their strike and participated in the negotiations. Coretta Scott King, along with union and civic leaders, led an estimated 42,000 people on a march through Memphis in honor of her husband and the workers’ cause. On April 16, the strike ended when the city agreed to raise wages and recognize the sanitation workers’ union. Lucy, an icon in the labor and civil rights movements, retired as AFSCME’s Secretary-Treasurer in 2010 after 57 years in the union. He co-founded CBTU in 1972 and served as its president for 40 years.